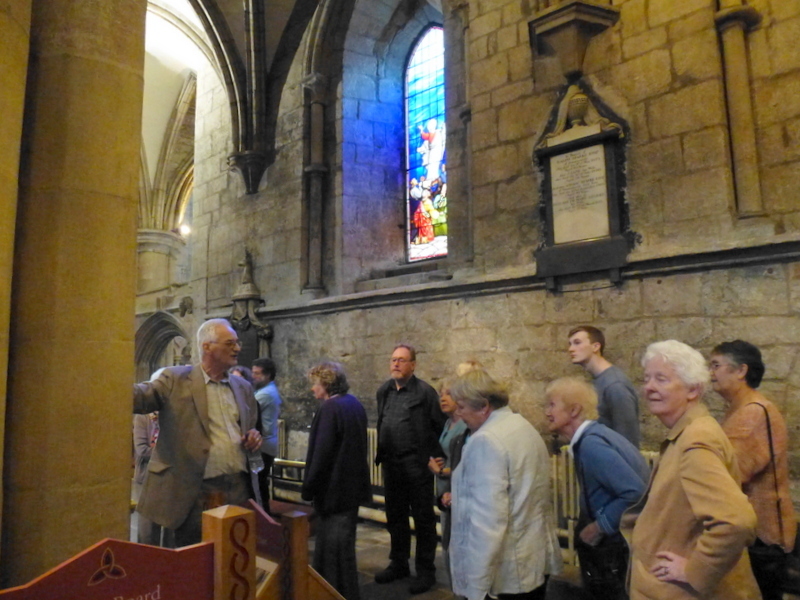 In mid-June 33 members of HLHS had a most interesting visit to Hexham Abbey. 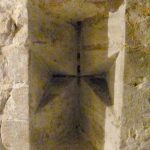 The evening began with a presentation by Tom Kelsey which illustrated some of the many things in the Abbey which most of us walk past without noticing, or which are hidden from view, such as masons’ marks, roof bosses and detailed carvings. He also showed pictures of artefacts which are known to have been in the Abbey, but which have disappeared or which are now in museums both in the UK and abroad. 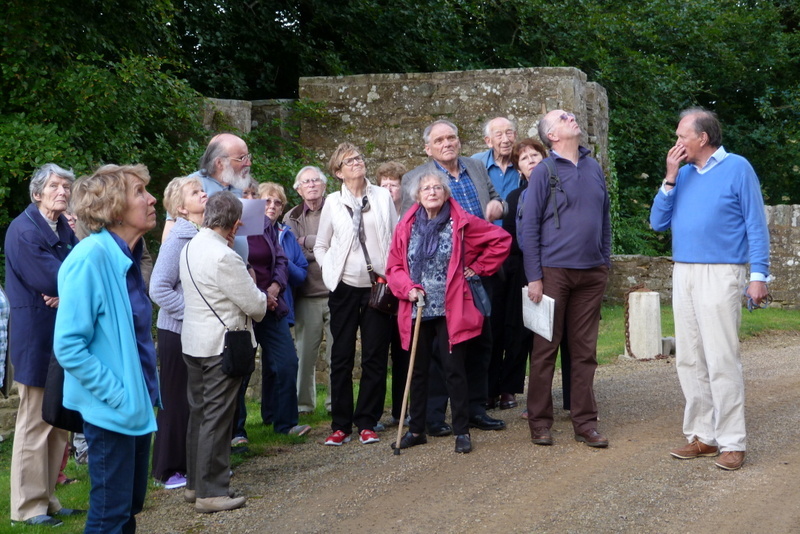 After the presentation, the group split into two, led by Tom and Chris Britton, for a tour of parts of the Abbey not usually seen by the public. 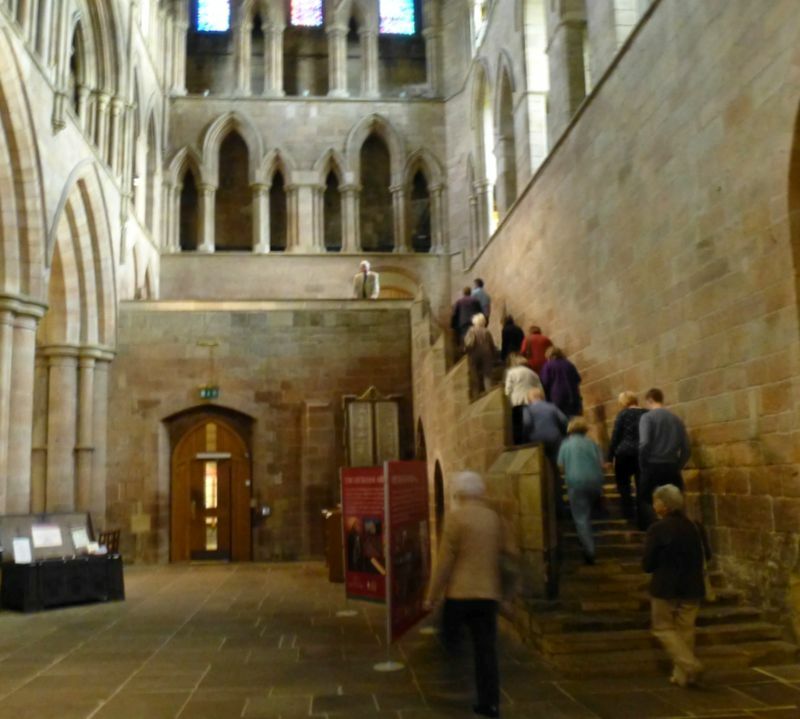 The Saxon apse below the chancel was revealed and Tom led his group up the night stairs to see the Treasury containing the monks’ medieval safe. 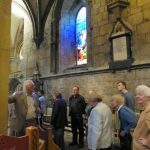 Chris took his group to the Prior Leschman chantry chapel beside the high altar and pointed out the interesting features to be seen there. Following the tour, most of the group joined other members of HLHS for a very enjoyable and sociable meal at Vercelli’s. This was a very interesting and enjoyable evening and many thanks go to Tom for his informative talk and also to Tom and Chris for their tours. Thanks also go to Jennifer Britton for organising everything and to the Abbey verger Derek Iles for facilitating the event. 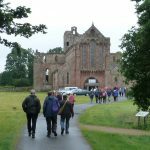 By 9am one bright Saturday morning a cheerful group of members and friends were enjoying the coach journey northwards on the A68 through glorious Northumbrian countryside and over Carter Bar to the Scottish Borders and our first destination – Melrose. 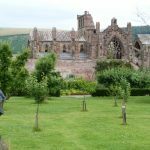 The coach park was very close to the magnificent Melrose Abbey so most of us chose to explore these substantial ruins before wandering into the town. 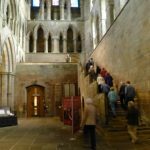 There is much to see in the graceful architecture of this 14th-century Cistercian abbey church including the burial site of Robert the Bruce’s heart, weird & wonderful gargoyles and the famous bagpipe-playing Melrose pig. Some of us even managed the circular stone staircase up onto the roof for a close look at the Bell tower and views across the surrounding countryside. 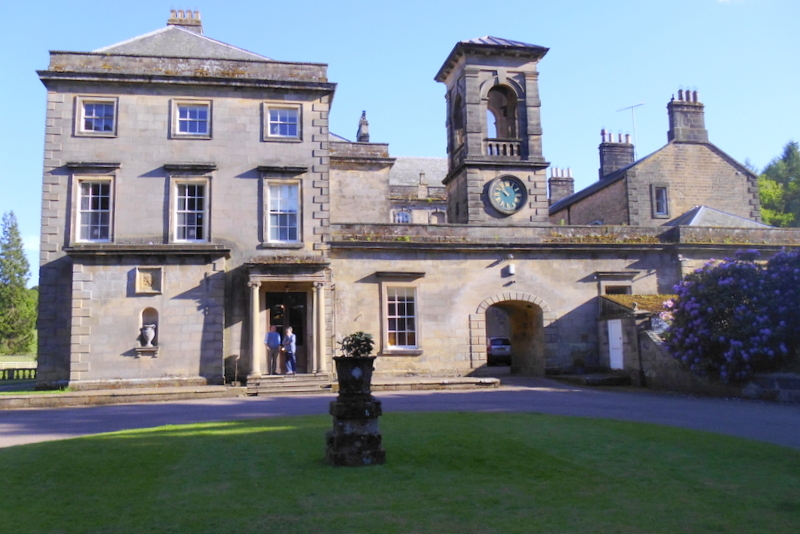 At 2pm we travelled a short distance to Monteviot House, family seat of Lord Lothian – better known as Michael Ancram MP. 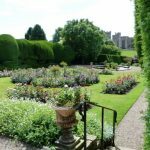 The house and gardens look down to the River Teviot and although the family acquired the lands in the sixteenth century the present house started off as an early-eighteenth century lodge built by the 1st Marquis. Additions and modernisations over the years have created the family home it is today. The enthusiastic guides who showed us round in 2 groups were very knowledgeable on the genealogy of the family and the artefacts which brought it all to life for us. 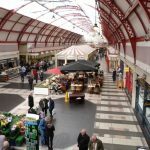 The homeward journey was broken for a tea & shopping break at the Woollen Mills outlet in Jedburgh – and we arrived back home by 6pm. 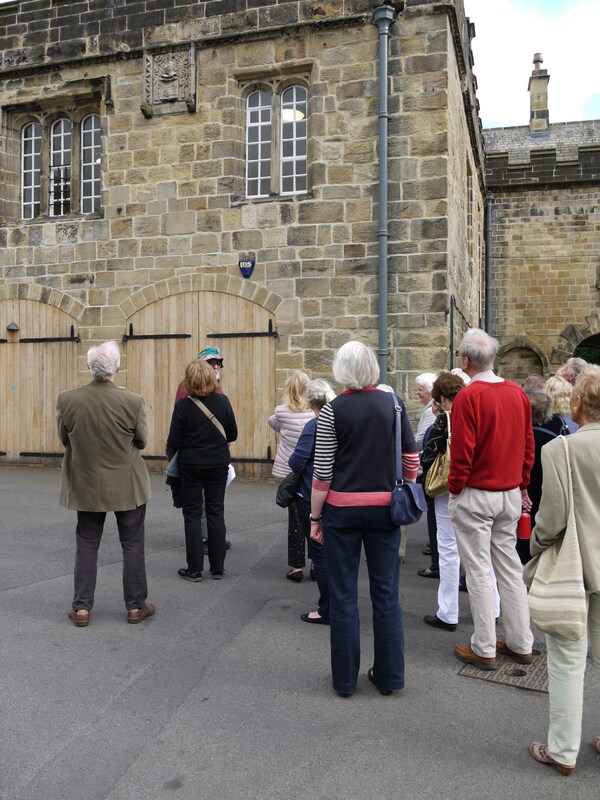 Trinity House, Newcastle, situated in Broad Chare just off The Quayside, is not open to the casual tourist, so 22 members went on an organised tour. 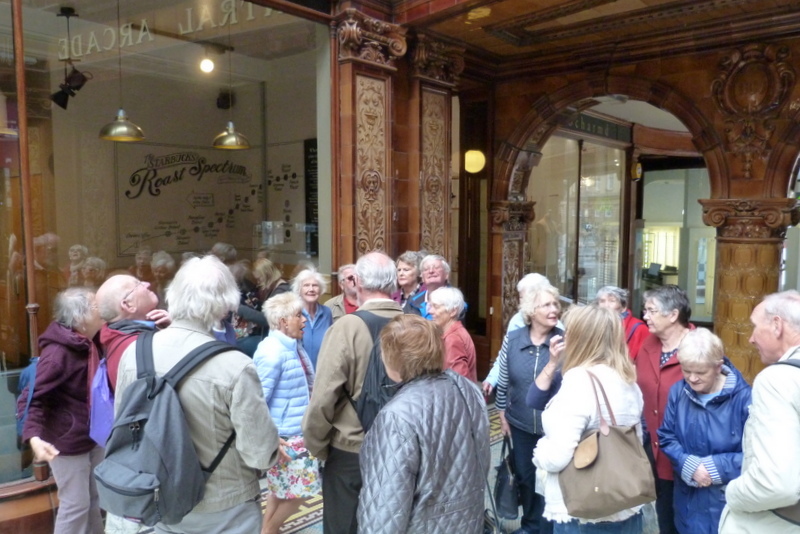 After gathering in the entrance hall, which is presided over by the ‘Summoner’ and adorned with strange stuffed and tarred sea creatures, we set off on our guided tour led by volunteer guide David Watts. 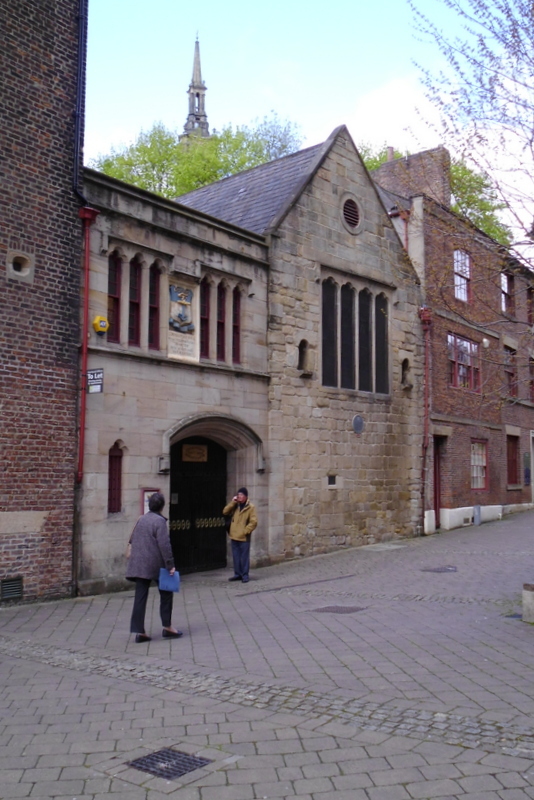 Trinity House was set up in the 16th Century to assist in pilotage and other safety measures on the Tyne, gradually extending its reach along most of the coast from Northumberland down into Yorkshire. It also had charitable and educational aims for mariners and their families. It still has charitable aims, but its original purposes have all since been ceded to other national bodies. The Banqueting Room has a beautiful painted plaster ceiling, with a ship at its centre surrounded by a compass rose. The walls, floor to ceiling, are panelled in mahogany and hung with a number of large paintings of old sea battles. Old crown glass in the windows gives a wavy view of the courtyard, and is etched in places with names of previous decorators – a form of advertising graffiti! The Boardroom, hung with more paintings of a maritime nature, is dominated by a huge painting from the School of Rubens depicting the allegorical representation of the four main continents, and also by a huge ‘prisoner of war’ ship model carved from beef and mutton bones. The Master’s Room was more intimate with a run of large glass fronted bookcases along one wall full of maritime journals and books by famous explorers. 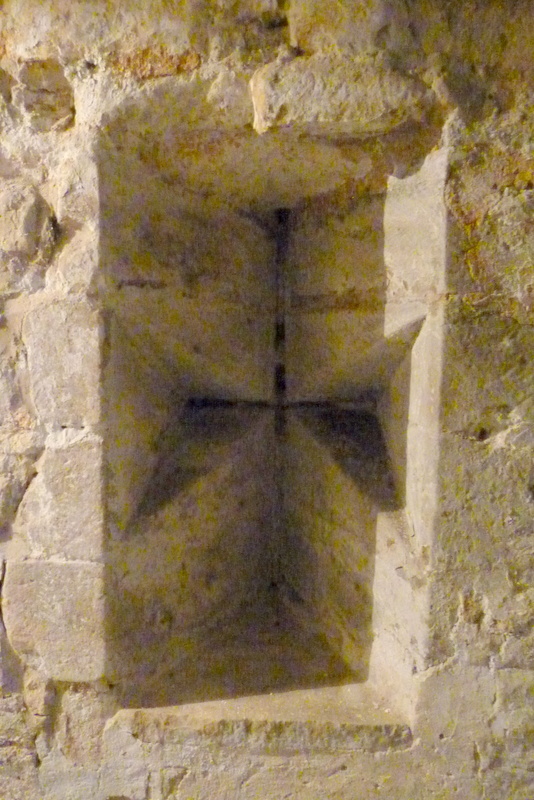 However, one of these proved to be a hidden door leading into the chapel, the oldest part of the building. 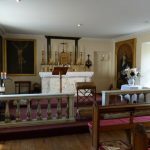 Refitted over the centuries, the pews, whilst looking good, proved rather uncomfortable! 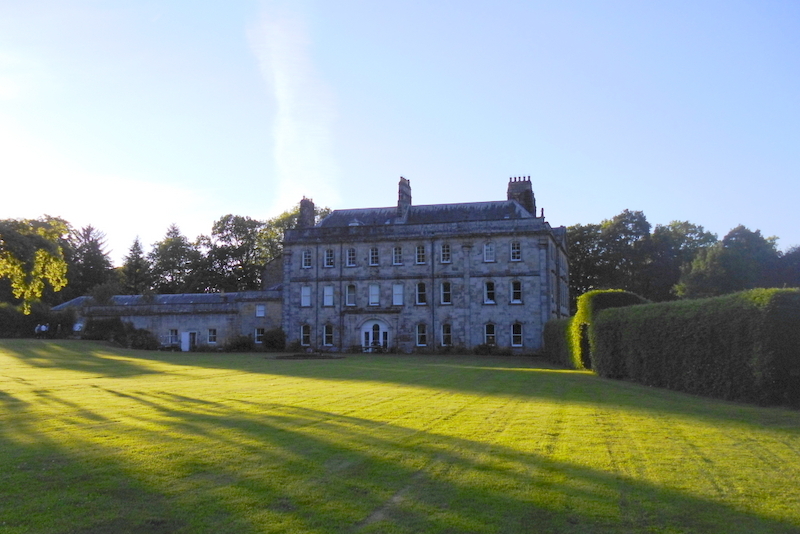 On a glorious June evening we met to be shown around Hesleyside Hall in the North Tyne valley. The surrounding parkland, an early commission for local talent Capability Brown, looked idyllic, although the site was originally chosen for its boggy nature, to deter rival Border reiving clans. 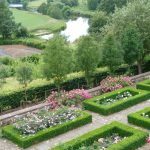 The family of our very welcoming hosts and guides, William and Anna Charlton, have inhabited Hesleyside continuously since 1343, when it was just a defensive pele tower built on land granted by King David of Scotland in 1135. We were told entertaining but blood-thirsty tales of Charltons feuding with rival reiving clans, and shown the actual spur used in William Bell Scott’s painting ‘The Spur in the Dish’. 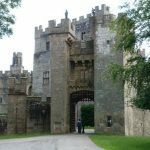 The magnificent house we now see was added to the pele tower in three stages – hence the 3 front doors! – in the 17th and 18th centuries, being completed in 1800 with a classic Georgian front by architect William Newton, who also designed the Theatre Royal in Newcastle. 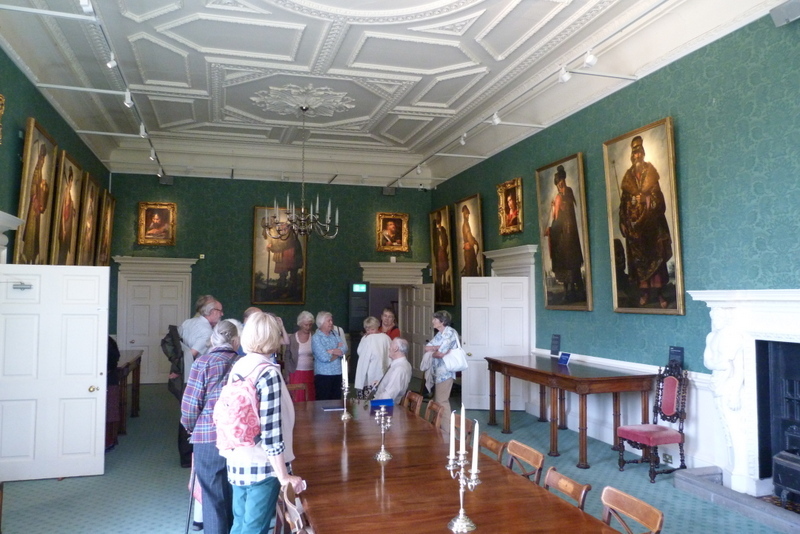 Inside the house, our tour of several beautifully decorated and furnished rooms was enlivened by the stories of the characters depicted in the family portraits. The fact that, unusually, the estate has often been handed-down through the female line has helped keep Charltons in continuous occupation. So has some strategic inter-marrying with other wealthy Northumbrian families such as Swinburnes and Fenwicks, and the occasional rich American! 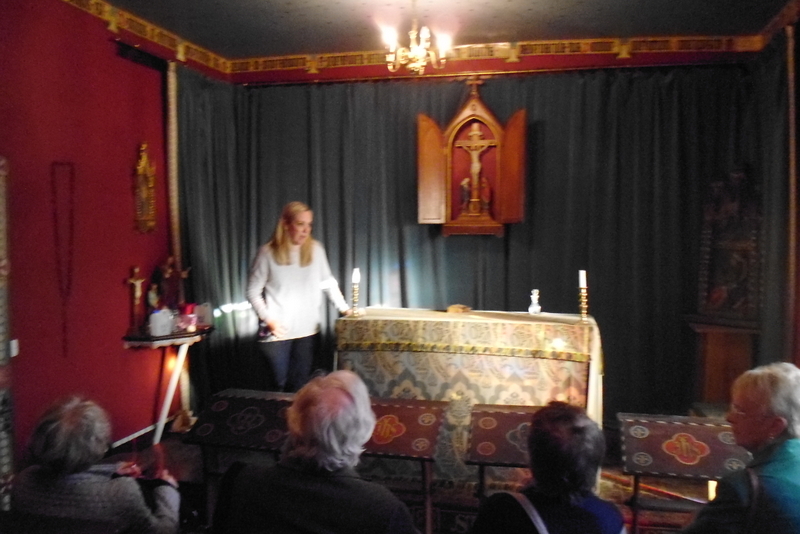 We ended our tour in the intimate private chapel, converted from a bedroom in 1838 when the family built St Oswald’s Church in Bellingham for the rest of the local community. 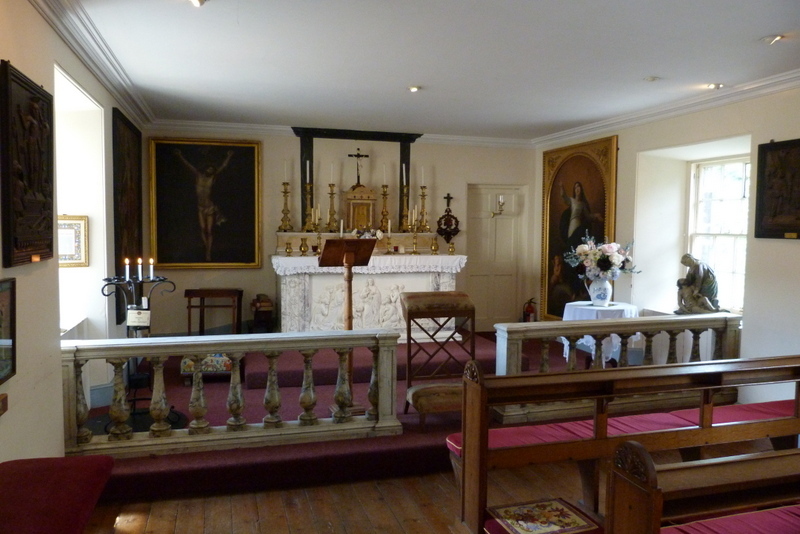 In earlier times the Charltons’ Catholicism necessitated a priest-hole in the house, and they were involved in planning Jacobite uprisings, including connections with the Radcliffes of Dilston. 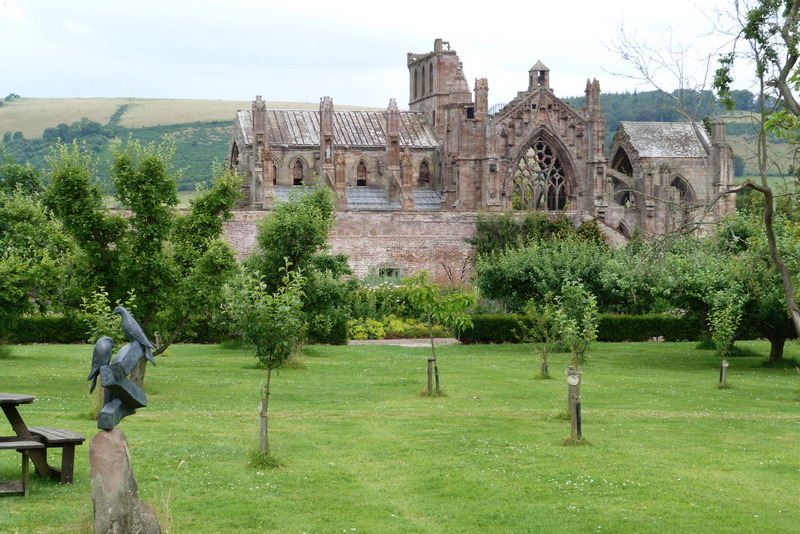 However one ancestor converted to Protestantism – for a year! – in order to become High Sheriff of the county. 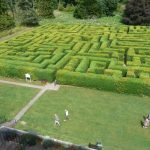 This pragmatic streak is now evident in the way the family is diversifying – offering luxury B&B in the main house, glamping in shepherds’ huts in the park, hosting weddings and guided tours – in order to meet the huge costs of maintaining an historic house. Many thanks to our hosts, and to Jennifer Britton for organising a most interesting and enjoyable tour. 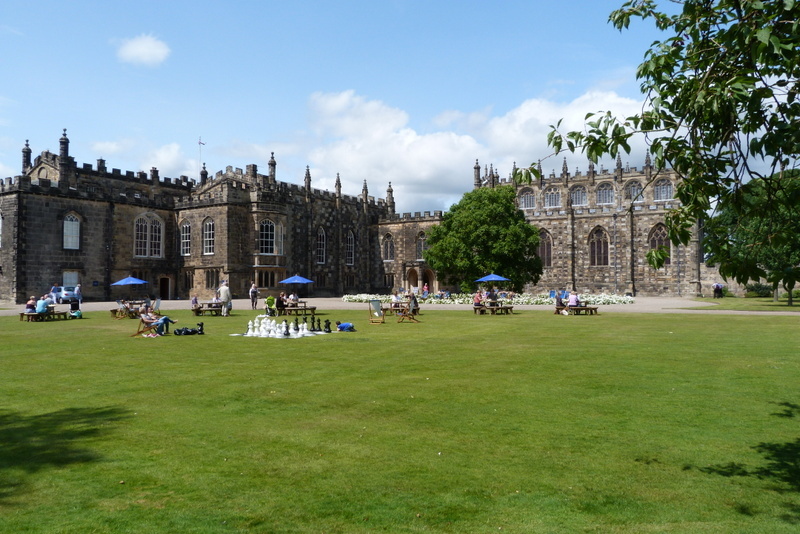 It was a lovely morning for our trouble-free pleasant trip to Auckland Castle where we arrived at 10:25 a.m., according to the impressive clock on the outer gate. Walking past a beautiful walnut tree surrounded by a circle of white roses we entered the Castle for our guided tour. 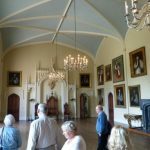 We first saw the large hall before going into the very impressive Chapel which was in earlier times the dining hall (a very long way from the kitchens). From there we went upstairs to the throne room containing a magnificent wooden throne before seeing the gallery specially built nearly 300 years ago to display the famous Spanish pictures of the 12 sons of Jacob. 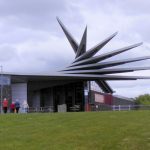 A small room leading off contained a comprehensive collection of photographs and silver relating to Bishop Auckland’s football team’s glorious past. 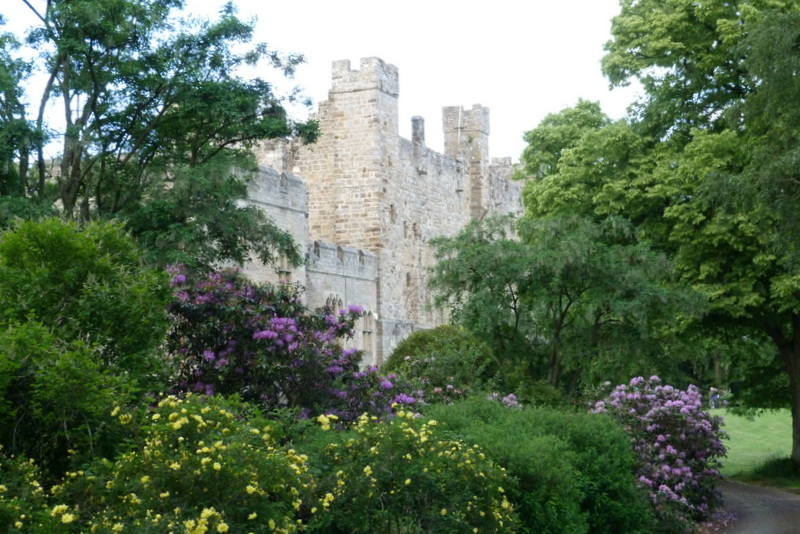 The Castle was inhabited by the Prince Bishops and then the Bishops of Durham for 900 years, but was sold to Mr Jonathan Ruffer some 5 years ago. 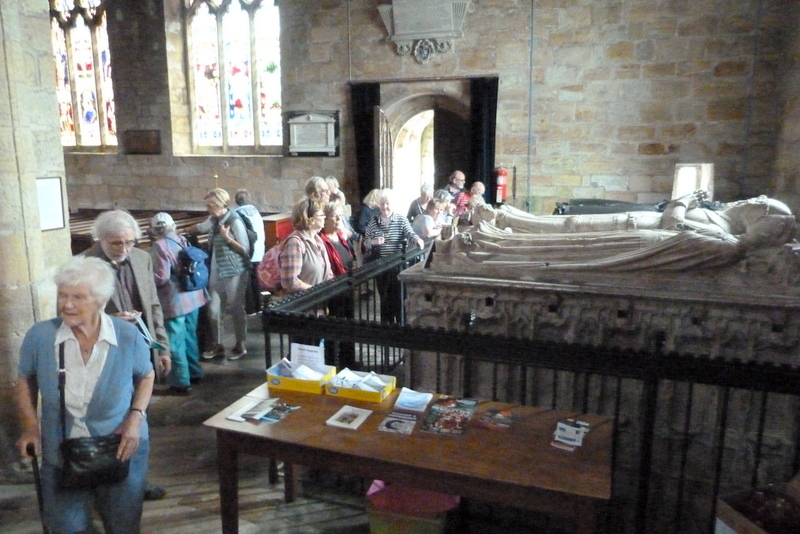 He intended to buy the Spanish pictures but on seeing where they are displayed, decided to buy the Castle as well, and now has imaginative plans for its future as part of the community of Bishop Auckland and further afield, including other fine buildings in the town and Binchester Roman Fort. 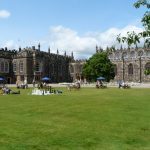 At present, the cafe is in the library, but there were picnic tables and chairs in the grounds and miles of beautiful walks through what had been a grand deer park for the Prince Bishops and friends. 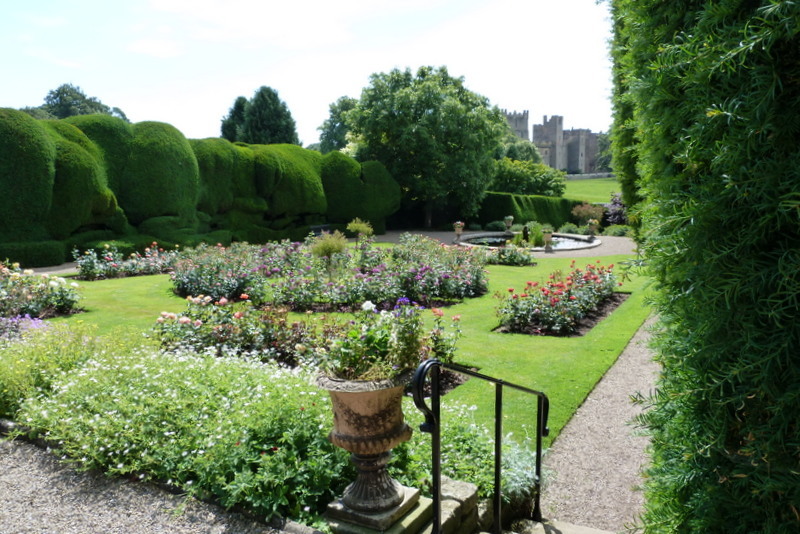 The oldest walled garden in the North of England, now waste ground, is being restored by apprentice bricklayers, gardeners and so on and is viewed from the raised driveway into the Castle. 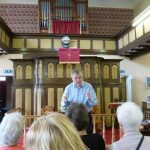 After lunch it was an easy ride up the Wear Valley to the Wear Valley Museum at Ireshopeburn where we had a short interesting talk in the High House Chapel about John Wesley and the early Methodists who became very numerous after Wesley’s several visits to the area. 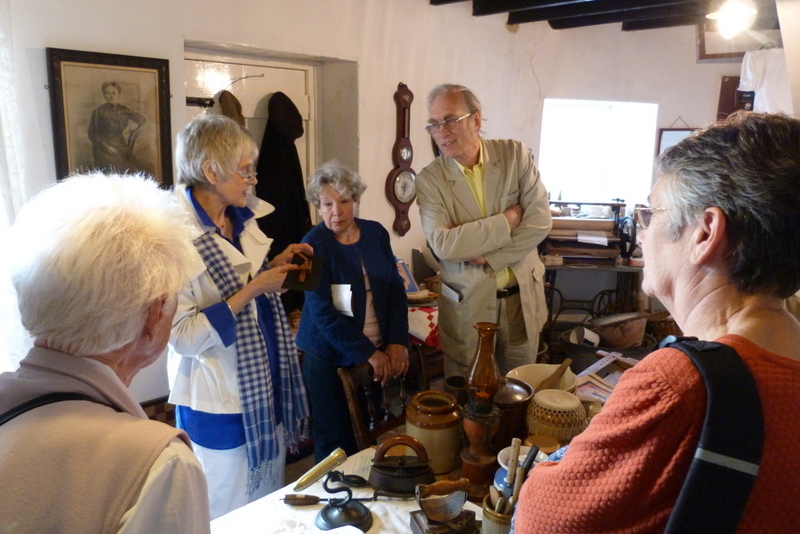 The visit included a walk round the two small rooms comprising the Museum, packed with household items and clothes dating from approximately 100 years ago, and some of which were quite familiar to us! 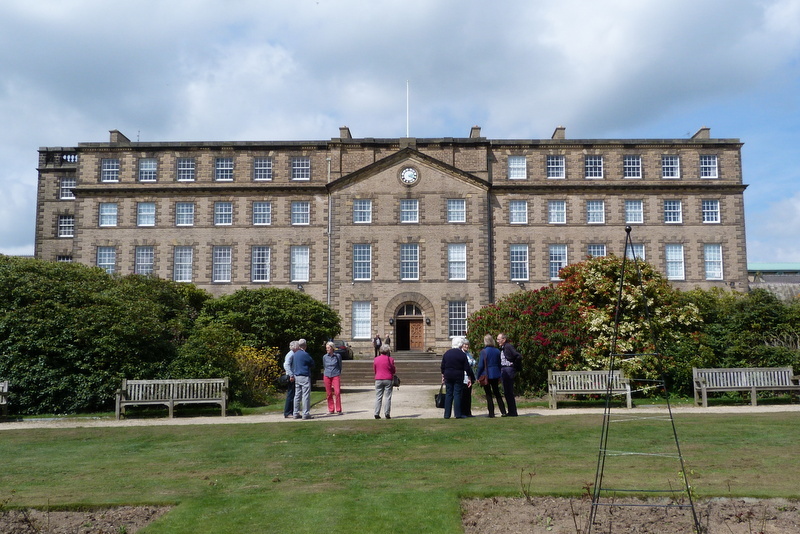 Thirty fortunate members of the Society met on a warm and sunny May afternoon at Ushaw College to hear about its history from the excellent and informative guides, and look round the fascinating buildings. 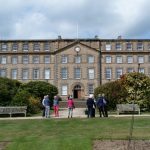 Ushaw played a vital role in Roman Catholicism in the north of England through the 19th and 20th centuries, but owed its establishment to the French revolution! For over 200 years Douai English College in northern France had been educating the sons of the English catholic entry, and training English Roman Catholic priests following the Tudor protestant reformation. Douai produced many of the martyred clandestine priests who were executed during the clamp-down on catholic worship in the second half of Elizabeth I’s reign. However, in 1793 the French revolutionary government suppressed the college when England declared war, and after a short period of virtual house arrest the staff and students fled back to England. The early Catholic Relief Acts of 1778 and 1782 had recently made Catholic worship and education legal in England, the Roman Catholic church was appointing bishops again, and it was therefore vital for the catholic establishment to found new seminaries in England. 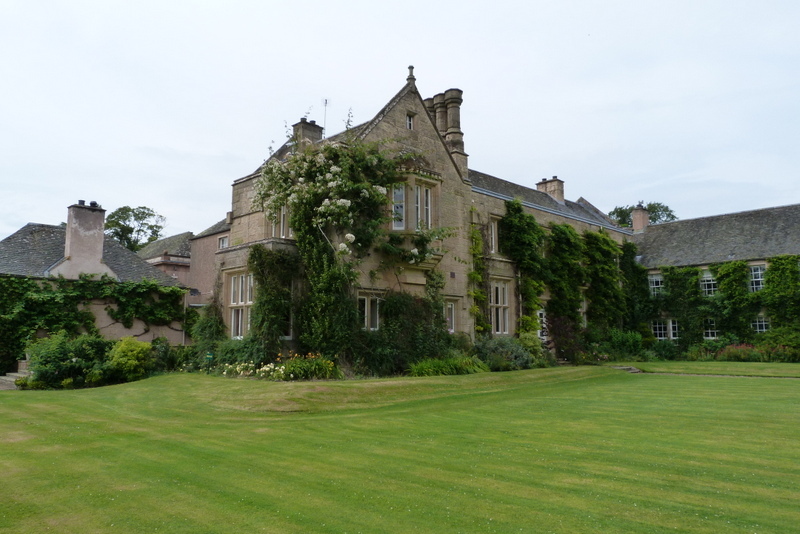 After a temporary stay in Crook Hall, the ancestral home of the Baker family near Lanchester, the new seminary for the North of England was opened by Bishop Gibson of Hexham in 1808 on its own private estate, with farm, kitchen gardens, private water supply and gasworks, at Ushaw. The establishment grew rapidly in size and influence during the nineteenth century, and a boarding catholic preparatory school was added. 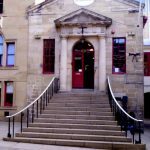 However, pupil and seminarian numbers were in severe decline by the turn of the 20th century and in 2011 the college closed. 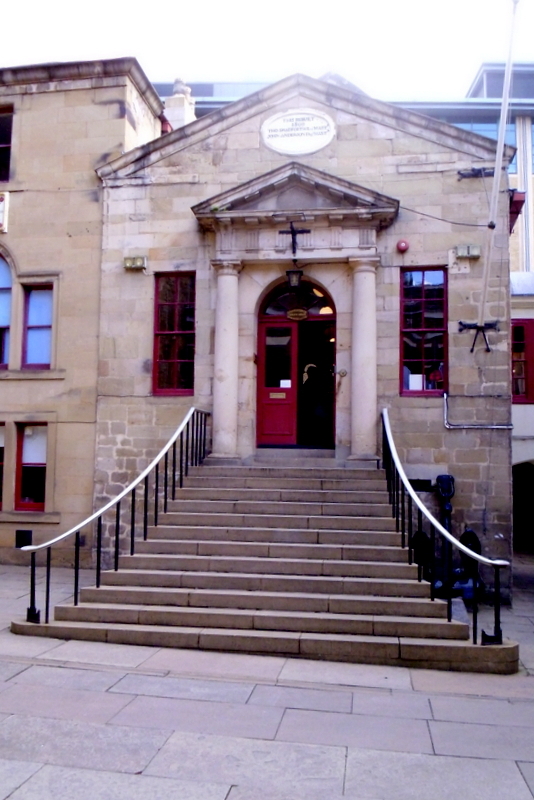 The school was already derelict and had suffered serious vandalism (it is still derelict) but a trust was established to find alternative uses for the main college and Durham University took over the more modern parts of the premises for their business school. 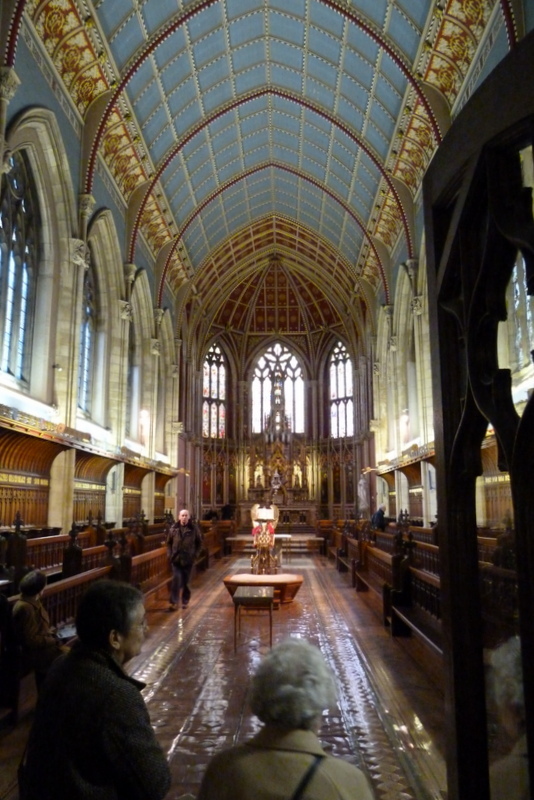 Our tour of the college buildings soon revealed why it was so important to preserve it. The first building by James Taylor, in classical style surrounding a courtyard, is full of Victorian gothic revival detail and decoration. 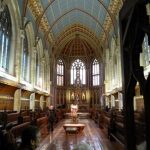 by three generations of the Pugin family and by Joseph Hansom, the noted church architect (and designer of the Hansom Cab). 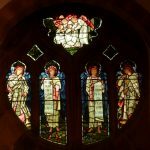 The main St Cuthbert’s Chapel is magnificent and highly decorated, and the same quality of decoration can be seen all over the building, from its fine stained glass windows, “gothic” stonework and carved woodwork, to the lovingly detailed brass door furniture and decorative floor tiles. Along the corridors, interspersed with rather forbidding pictures of former Masters, are some of the relics of the college – including silverware from Douai, hidden under the floor there during the flight from the French revolution and finally recovered many years later, and a curious selection of bats and rackets used to play ball games in a series of extraordinary outdoor stone-built courts in the grounds. Perhaps what appealed most to the visitors was the visit to the library. 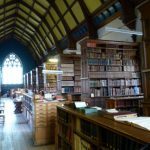 The college library as a whole contains over 30,000 books, many of them held in the magnificent Great Library which forms the opposite front wing of the building to St Cuthbert’s Chapel. This is also in gothic revival style and its shelves are packed with finely bound and rare books. The college sought to provide a broad education so, although there are many volumes relating to theology, we also saw a first edition of The Origin of Species, W.G. Grac e’s book on cricket, a presentation portfolio of engraved illustrations from Louis XIVth (one of only two complete sets in the world) and early copies of Dickens novels. The library contained two sections of shelving that were kept locked during the working life of the college. Expecting to hear some sensational revelation, instead we learned that one was for protestant theological literature, while the other contained the library’s most valuable and irreplaceable early printed books. Thanks are due to Jennifer Britton for the usual excellent organising, and to Chris Britton for the photos. This highly anticipated outing had ‘sold out’ in minutes earlier this year and the 26 members at Haughton on a warm and still summer’s evening were not disappointed. This is an extraordinary building in a sublime setting, commanding the south bank of a bend in the North Tyne between Humshaugh and Barrasford. Approaching along the drive, it emerges high above the rhododendron bushes, a 13th century ‘hall house’ according to Peter Ryder, the renowned buildings expert who we were fortunate to have as our guide. 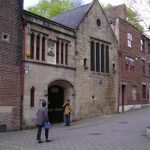 The original house – occupied by the Swinburnes and then the Widdringtons – was extended, upwards, more than once during the troubled 14th century. In a ruinous state by Tudor times, it was later patched up and extended yet again, most thoroughly by the addition of a modern wing by the Victorian architect Salvin, alongside ‘improvements’ added on by John Dobson. What we see today is therefore a rambling, complicated and fascinating building, from the cellars to the top floor with its views to north and south. Here is a medieval spiral staircase leading to an empty chamber with a bowman’s defensive opening, and there a wide Jacobean-style flight of stairs beneath stags heads, ancient portraits and an arrangement of pikes and longswords. Our host Antony Braithwaite complemented Peter’s understanding of the building fabric with pen pictures of some of the owners and occupants, apparently including some reasonably benign ghosts. 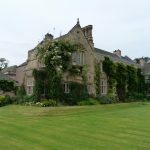 Haughton has been a ‘project’ for a succession of owners since the 19th century and is clearly held in great affection by Antony, the latest steward of this astonishing piece of our local heritage. 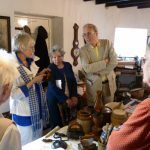 Our thanks go to him, to Peter Ryder, to our chairman Peter Rodger and to outings organiser Jennifer Britton for hosting and organising such an interesting and enjoyable visit. As is becoming customary for HLHS outings, the sun shone, and so the views of Weardale and Teesdale on our drive to Raby Castle were spectacular. 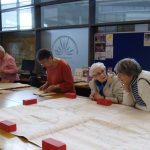 On arrival, we were met by the Curator, who gave us a most useful brief introduction to the site and its history – and pointed us in the direction of the tearoom where many had a fortifying cuppa or an early lunch. Dating from mediaeval times, Raby remains externally a ‘proper castle’ (as my companion commented); but inside, it is a remarkably well-kept family home, much altered and refashioned over the centuries. 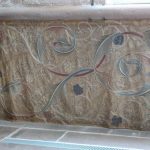 We all marvelled at the excellent state of repair of the fabric and contents, a tribute to the custodianship of the Vane family since 1626. Brass was polished, wood shone, and not a spider in sight! 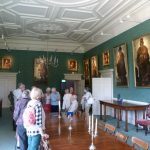 The rooms contain a wide selection of paintings, furniture and porcelain, with something from every century and for every taste, from the grandeur of the silk and gilt Octagon Drawing Room to the simplicity of the servants’ quarters. 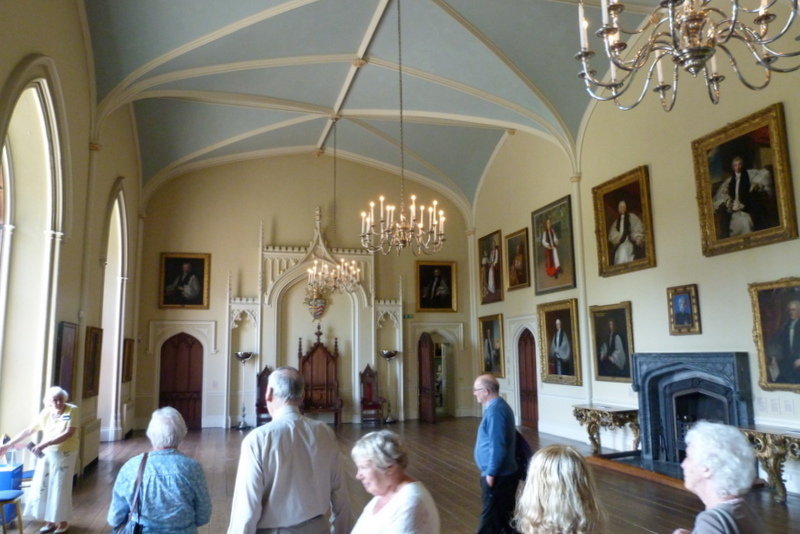 Perhaps most impressive was the Barons’ Hall, large enough to hold 700 knights and reputedly where The Rising of the North was plotted in 1659. There, we were treated to a piano recital by a very talented local schoolgirl. 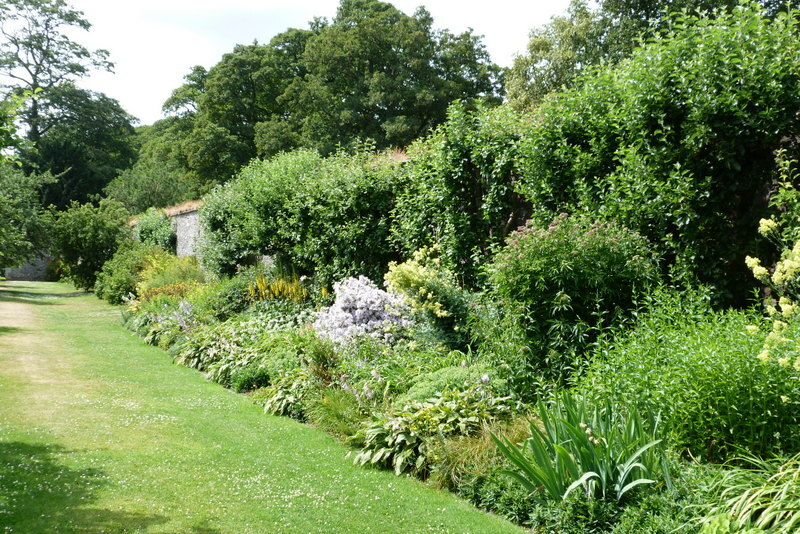 Outside too, Raby is very well maintained and the beautiful gardens provided seats and shady corners for picnics or simply to enjoy the sunshine and flowers. There was time to wander through the extensive deer park, with two lakes full of families of wildfowl. The late 11th Lord Barnard’s reluctance to cull meant that deer were easy to spot! 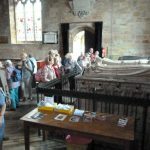 After a leisurely visit to the castle and grounds, we moved on to the adjacent village of Staindrop where in St Mary’s Church (“The Cathedral of the Dales”) we marvelled at the magnificent tombs of the Neville and Vane families and the Vane family hatchments. 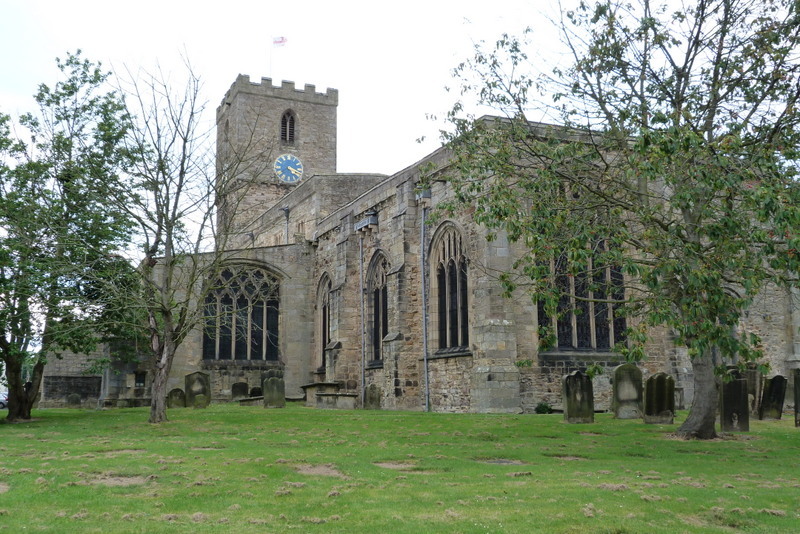 The church is Saxon in origin and contains much of architectural interest. 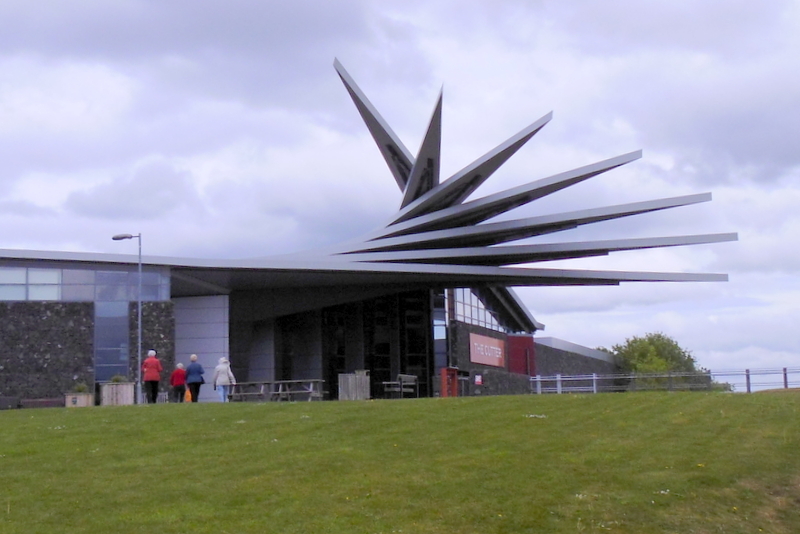 On Tuesday 16 May 18 members went on a very interesting tour ‘behind the scenes’ of the Northumberland Archives at Woodhorn. 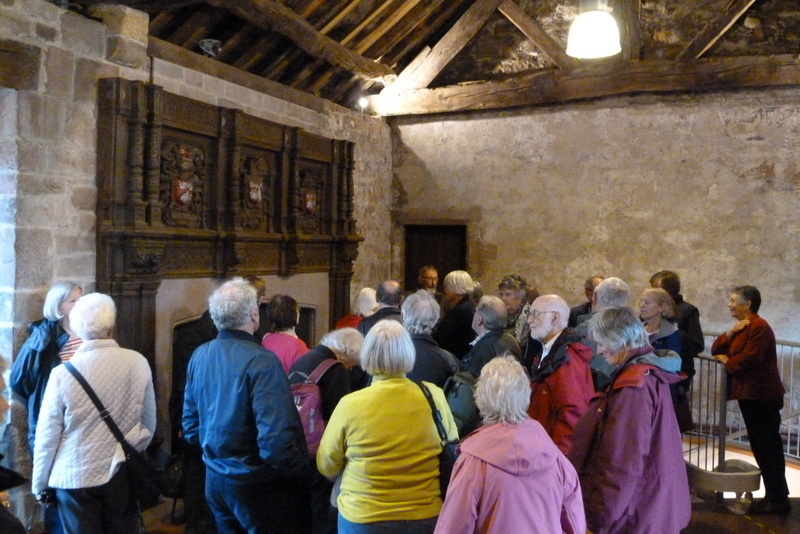 We had a detailed talk by Michael Geary, the Head Archivist, on the service and then split into two groups. 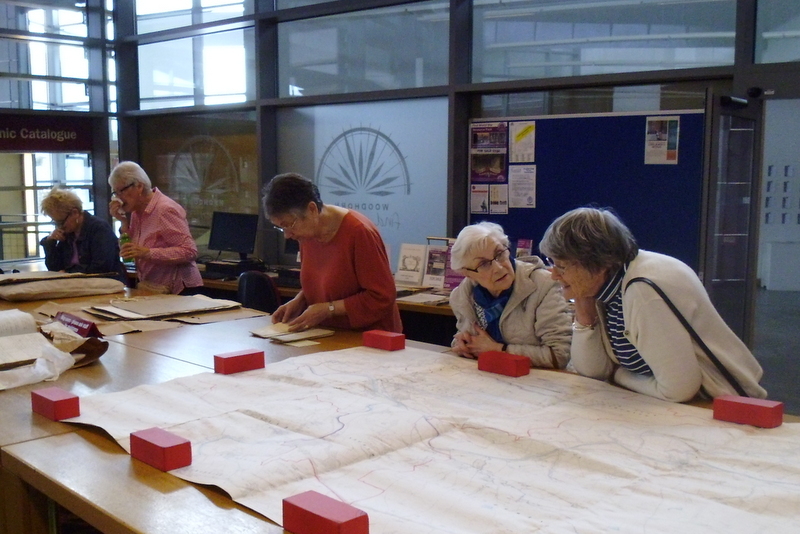 One group explored a number of interesting items, mostly relating to Hexham, that had been laid out for us to see; such as old photographs of the town, workhouse overseer’s books, copies of the ‘Hexham Herald’ and a fascinating map dating from the early 1900’s showing the extent of the first provision of electric lighting in the area. The other group went behind the scenes into the climate controlled storage areas to see a variety of things such how the documents are stored and accessed. One (very chilly) room contained huge numbers of photographs including many glass slides by Gibson of Hexham. In another we saw many remarkably dirty bundles of ancient copies of the Courant which had been recently deposited. We were also lucky enough to view a marvellous collection of paintings by ‘Pitman Painter’ Oliver Kilbourn. The groups then switched over halfway through. As this was a day when the Archives were not open to the general public we had the privilege of having the place to ourselves and didn’t even have to pay for the car park! 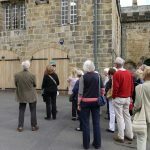 Hexham Abbey Cloister porch saw twenty two members of HLHS gather on Tuesday 13 June 2017 to join company with Peter Ryder on a tour of some of the discoveries made during the recent restoration of the buildings. We went first to the outer court of the medieval Abbey, to see the Carnaby Building, built in 1539 as the stronghold of Sir Reynold Carnaby, who had been a March Warden, and who was thus described in ‘The Pilgrimage of Grace 1536-1537 and the Exeter Conspiracy 1538 by Madeleine Hope Dodds and Ruth Dodds, Vol. II’: “Sir Reynold was already held in evil report among his neighbours, and if he had informed against the canons his life would not have been safe. The people of the neighbourhood loved their Priory, and to this day Carnaby is spoken of with hatred in the countryside.” Peter pointed out the Carnaby Coat of Arms, with stone carved earrings still dangling; the remains of a Gun loop; and listening chamber to the left of the Arch. Despite the ravages of two fires in the late 1700s and early 1800s, the strong Carnaby Building and its timberwork survived. 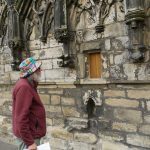 We then walked to the Cloisters, and inside the Carnaby Building, with Peter keeping our fascinated interest, using his expert knowledge to point out what to look for, and where, including garderobes, and wonderful stone carvings. 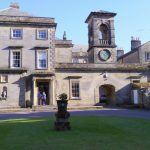 We made our way to the Prior’s Hall, which has a magnificent medieval stone fireplace, where we were welcomed with a drink of choice, and then enjoyed the most delicious savoury buffet, followed by a choice of cakes for anyone who had room left. 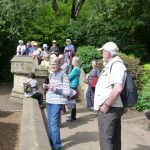 At the end of our visit, when we left the Abbey buildings, we were regaled by Hexham Brass Band rehearsing in the Bandstand on the Sele. What a wonderful way to round off such a lovely evening. 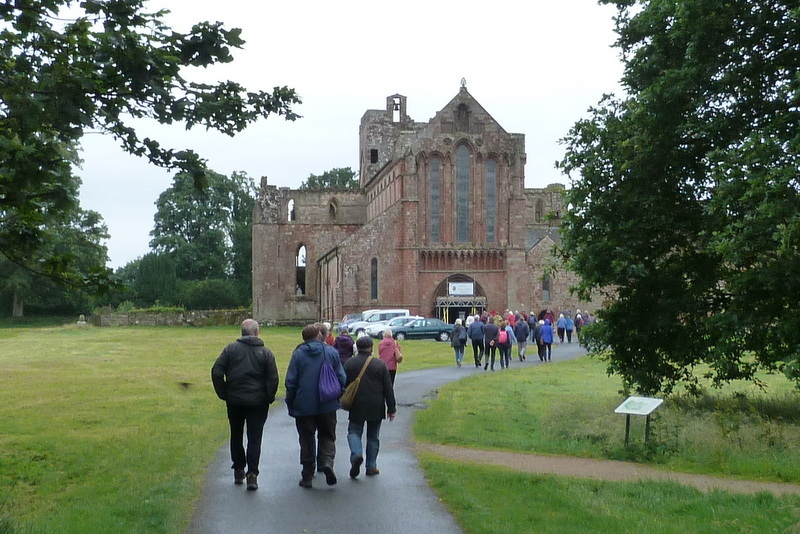 As the History Society outing grew close we scanned the forecast to see what the weather promised: but a grey damp day dawned for 43 members as we climbed into the coach to drive to Lanercost Priory church. We arrived within an hour to the beautiful complex of red Cumbrian stone buildings to find Mr John Lee our guide waiting for us. He speaks well and is clearly steeped in the history of the mainly 13th century priory. 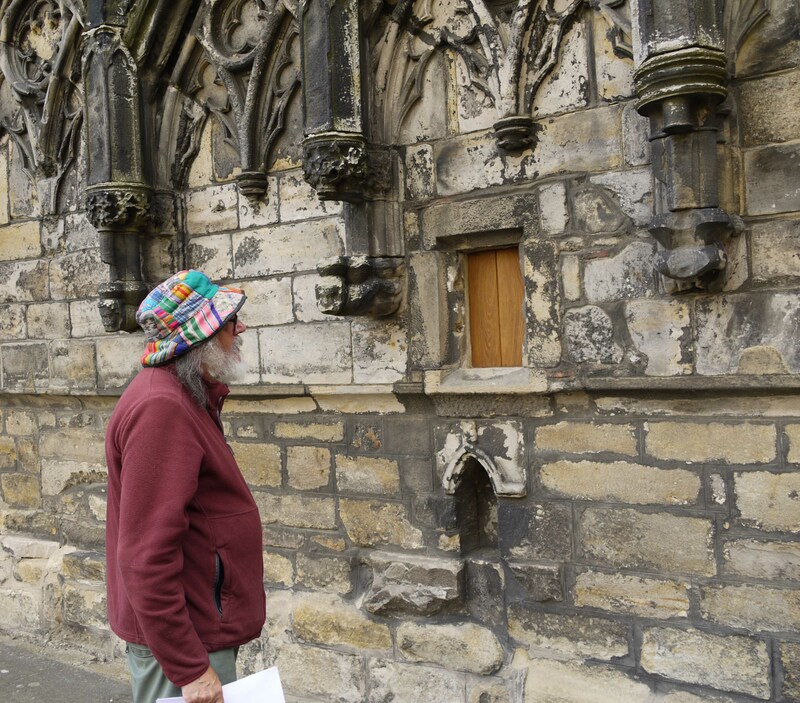 Before we entered Mr Lee pointed out the niche of St Mary Magdalene, the church’s dedicatee, above the door, fronted by the monklike figure known as a ‘donor’ something of a rarity in this country. 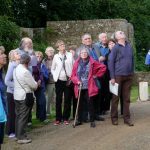 Our group was invited to sit whilst our guide recounted the founding of this Augustinian house and its Canons by Robert de Vaux in c. 1169, the visits by Edward I, the wars with Scotland, the Dissolution of the Monasteries and finally border warfare. 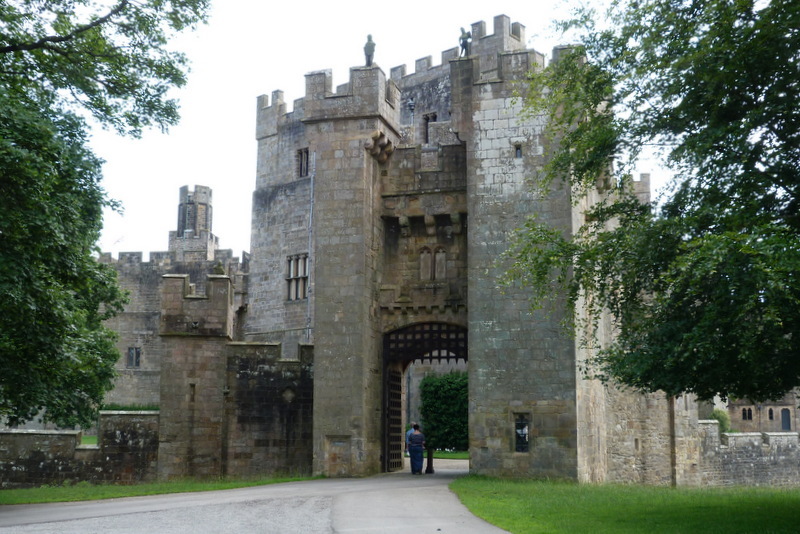 By the 16th century the Dacres entered the stage followed by the Howards of nearby Naworth Castle. 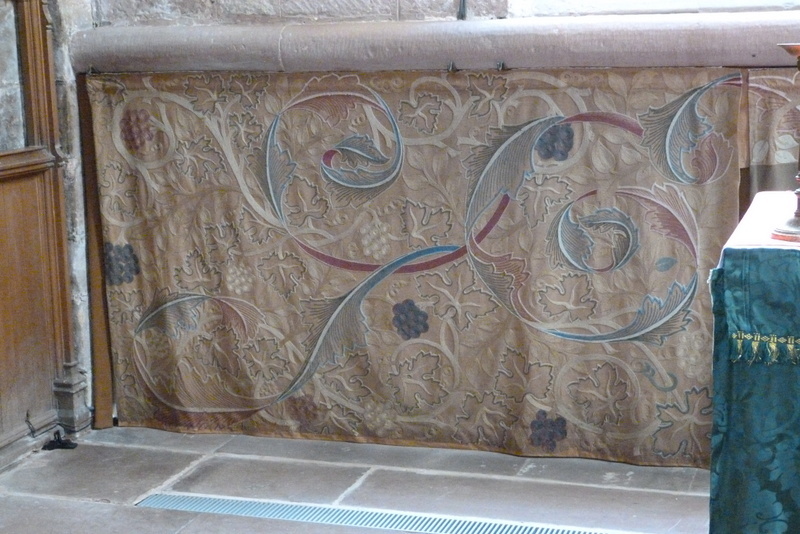 My own favourite item in the church was the cloth, known as a Dossal, hanging behind the Altar, which was designed by William Morris, one of the founders of the Arts & Crafts movement in the late 19th century. This hangs beneath the massive clear glass window of the East wall, showing the outside roofless buildings. A little faded now, but the reproduction at the back of the church showed the glorious colour and design of the original work. Chris Britton was invited to play the organ, which was soothing as we walked around. Outside we spread out into the ruins with the splendid roofs and tombs of the Dacre and Howard families. 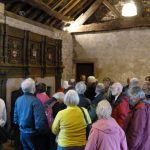 Lunch was served in the 16th century Dacre Hall with its fireplaces and oak overmantel and we completed our meal with John Lee drawing our attention to the traces of the wall painting, an important survivor of the time in the north-west. 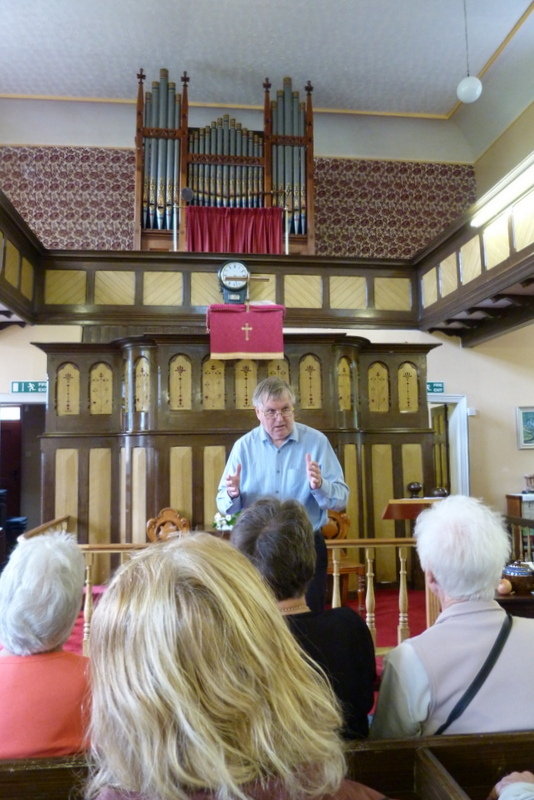 The bus carried us the short journey to Brampton where, after a warm welcome from the Vicar, and guided again by John Lee we were to visit St Martin’s Church which was the idea of the then Vicar, Henry Whitehead, in 1874. 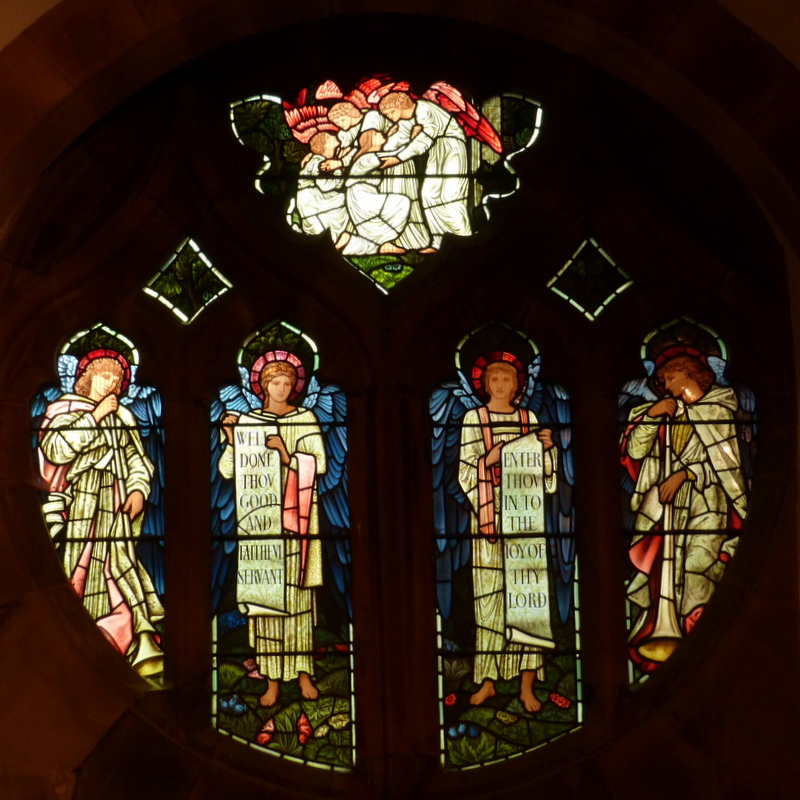 It was designed by the Arts and Crafts architect Philip Webb and the stunning stained glass windows, all memorials to local people, were made in 1878 – 1880 by William Morris & Co, and designed by the pre-Raphaelite artist Edward Burne Jones. 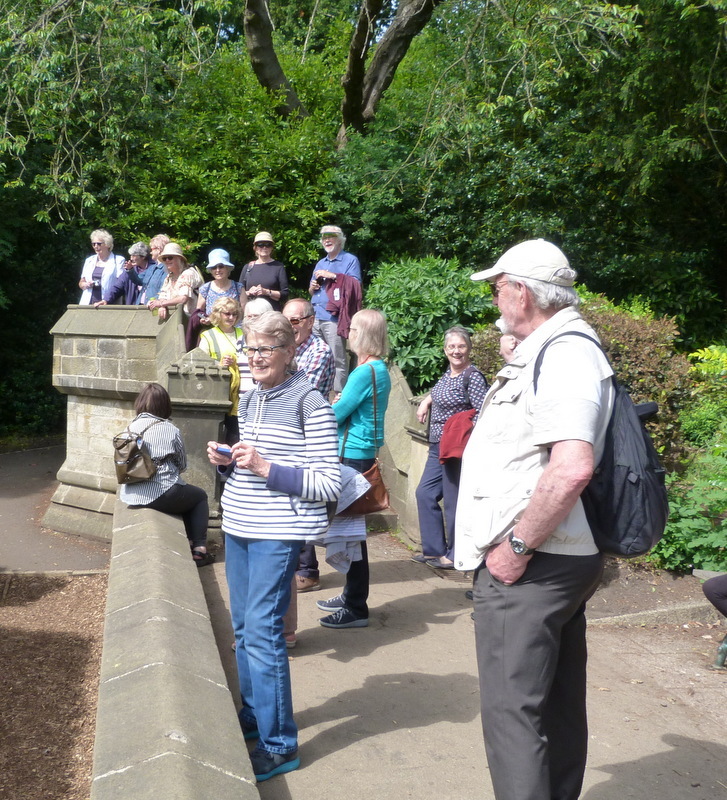 This mid-summer outing left us all with a strong desire to return very soon to learn more of this area as we sampled the refreshments of Brampton before returning to Hexham in the mid-afternoon. 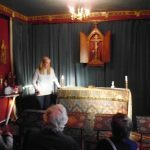 I feel sure we are all grateful to our organiser for the work involved in planning and execution of these visits, so thank you Jennifer for providing us all with such enjoyment. 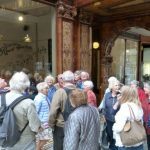 It was a cool blustery afternoon when the group gathered beside Grey’s Monument at the northern end of Grainger Street where our enthusiastic guide, Freda Thompson, started the tour with a brief summary of the career of Charles, Earl Grey – The Man on the Monument. Most of us knew he’d been Prime Minister in the 1830’s and that his favourite blend of tea still carries his name but not that the head of his statue had been severed by lightning in 1941 and landed on a tram – luckily without loss of life. 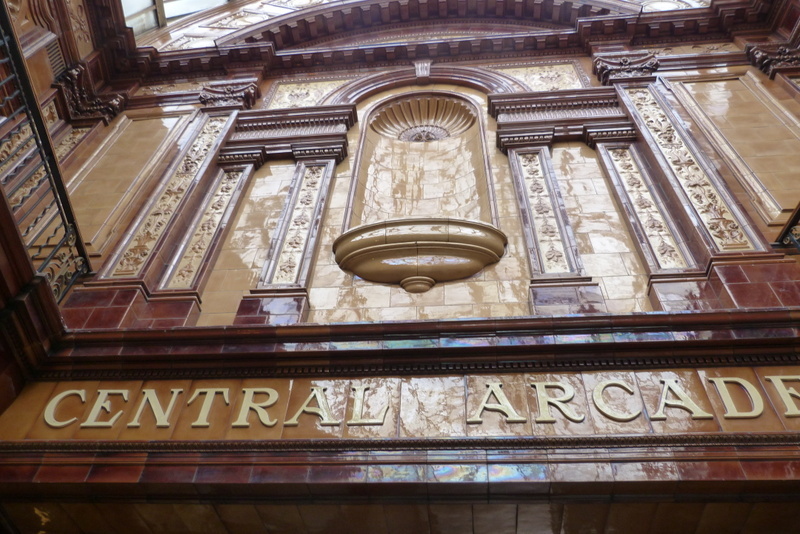 From there we moved to the elegant Edwardian ‘Central Arcade’, a walkway lined with shops that is a showcase of art in its own right. 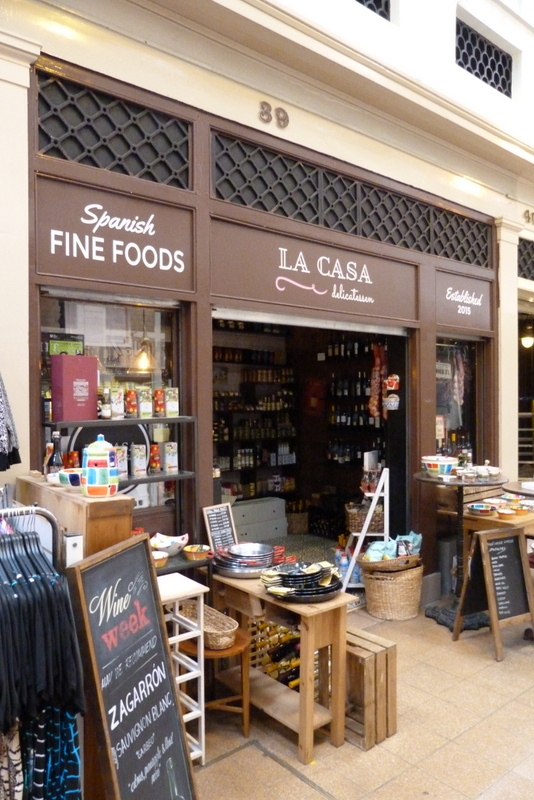 Freda explained how it had looked in it’s heyday with retail outlets on two floors. 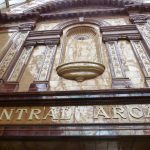 The glass barrel-vaulted roof, tiled walls & intricate floor are as much of an attraction as the shops and it was no surprise that the tiling alone is insured for one million pounds. 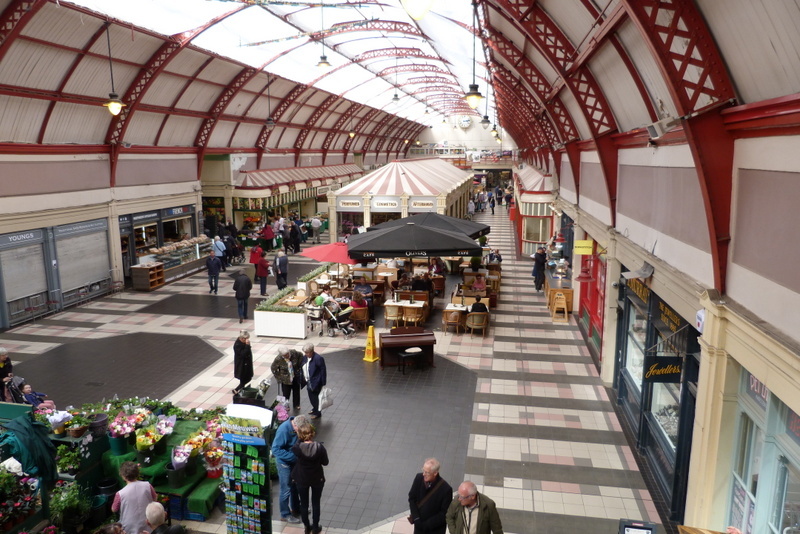 From the Arcade it was only a short walk to the main focus of our tour, the Grade I listed Grainger Market which was built in 1835 and has been an important part of the city’s shopping experience for almost two centuries. Freda had a wealth of fascinating information to share including photographs of the Opening Ceremony & Dinner. On that day the hall was crammed, not with stalls but with gentlemen wining and dining at trestle tables. Those able to afford the most expensive tickets sat closest to Grainger, other wealthy business owners and civic dignitaries, but at least all men were seated whilst the ​l​adies of the city had to stand and watch ​proceedings ​from the furthest extremities. 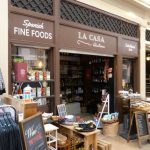 As Freda showed us up and down the aisles of the modern Grainger Market the bright and buzzing atmosphere made ​quite ​an impression. 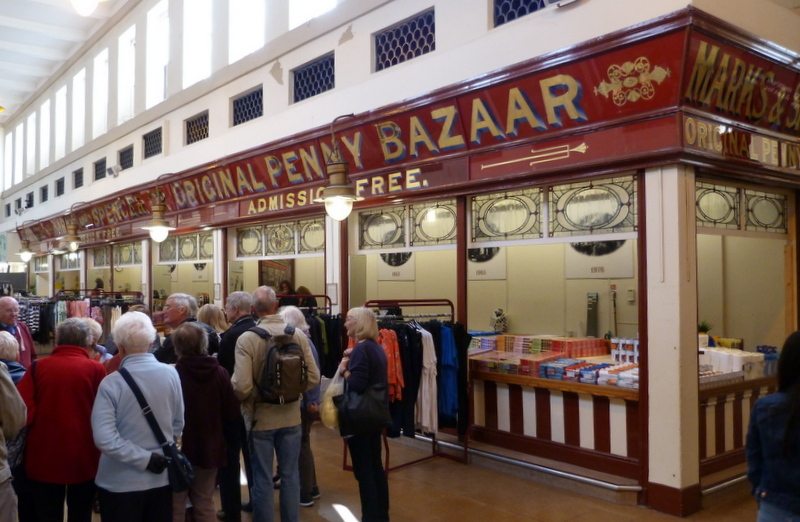 Alongside craft stalls, mini bazaars, jewellers​, florists, high quality butchers, artisan bakers and greengrocers we found ​Marks and Spencer Original Penny Bazaar, the world’s smallest M & S store ​and The Weigh House, the original facility used by retailers and customers to check the weight of their goods. 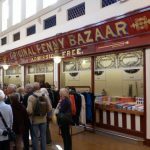 A measure of how much we enjoyed the visit was in the number of us who stayed on to sample the cafes & ice cream seller and to pick up some bargains. On a beautiful sunny afternoon (how does Jennifer keep managing these?) 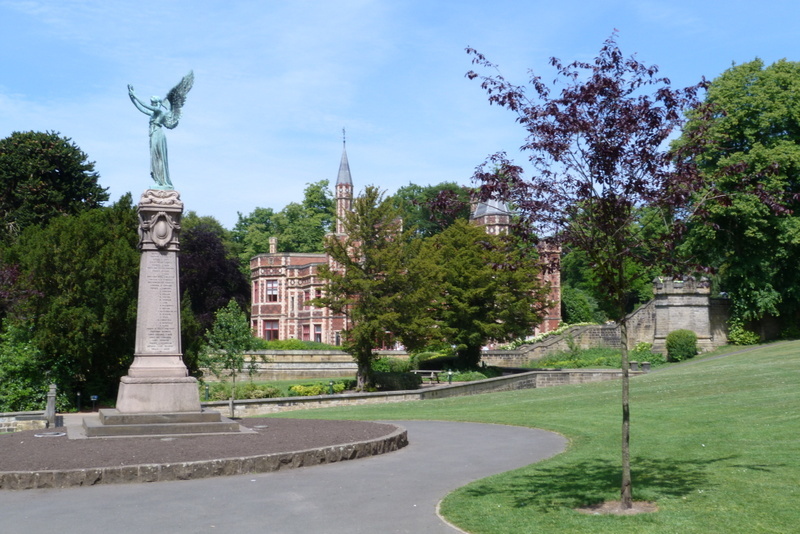 17 members went by coach to Saltwell Park in Gateshead. 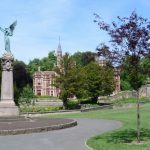 Built in 1871, Saltwell Towers was originally the home of William Wailes who began life as a grocer but then took up manufacturing stained glass. By the 1870’s he employed over 70 men, and our Abbey has four of his windows. However, Wailes ran into financial difficulties around the same time that Gateshead Council were looking to provide a public park to try and keep the local populace out of the alehouses! 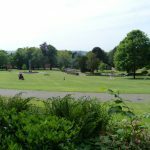 Wailes did a deal with them – he sold the Towers and its park to the Council on condition that he could live in the house for the rest of his life. So the park opened to the public in 1876. Extended since, it provides everything one might expect of a park: tennis courts, bowling greens, a boating lake, two large playgrounds for children etc. 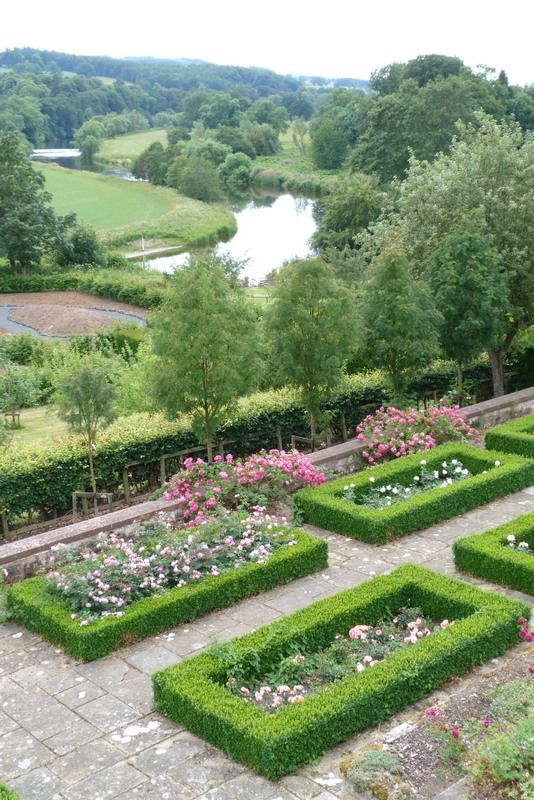 It also has many beautiful features- a lovely dene, rose garden, 12 Listed Buildings, modern sculptures and much else. Amazingly, although sited in a heavily built up area and overlooking the Team Valley Industrial area, none of this can be seen from the park. 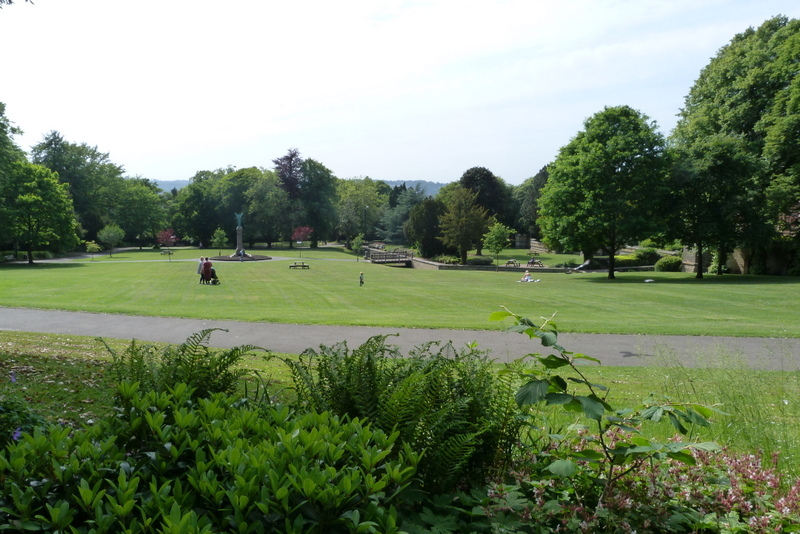 Despite constant Council cuts, the park still looks good, largely due to the efforts of The Friends of Saltwell Park and their teams of volunteers; indeed it’s one of the cleanest parks we’d ever seen and is clearly very well used and appreciated by visitors from near and far! Lottery grants enabled the exterior restoration of the Towers (jerry-built, we learned!) and the interior gutted to provide a modern café on the ground floor and function rooms above, as well as other restoration projects around the park. Two of the Friends gave us a very interesting guided tour, and if you’ve never been, you should go – plenty of free parking in the park as well! 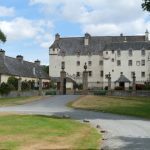 A coach-load of HLHS members forsook the Wimbledon men’s final for an excellent visit to Traquair House in the Tweed Valley. The weather was lovely, the view from Carter Bar was at its best, and the route up the Tweed showed off the Borders scenery to full advantage. 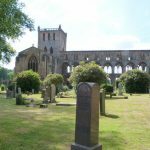 We made a very welcome stop in Jedburgh, where we had time to stroll around the pleasant little town, dominated by the remains of the abbey built by King David I for Augustinian canons in the first half of the 12th century. The nave and west end have survived particularly well, apparently because the nave was used as the post-reformation parish church until a new church was built in the town in 1875. 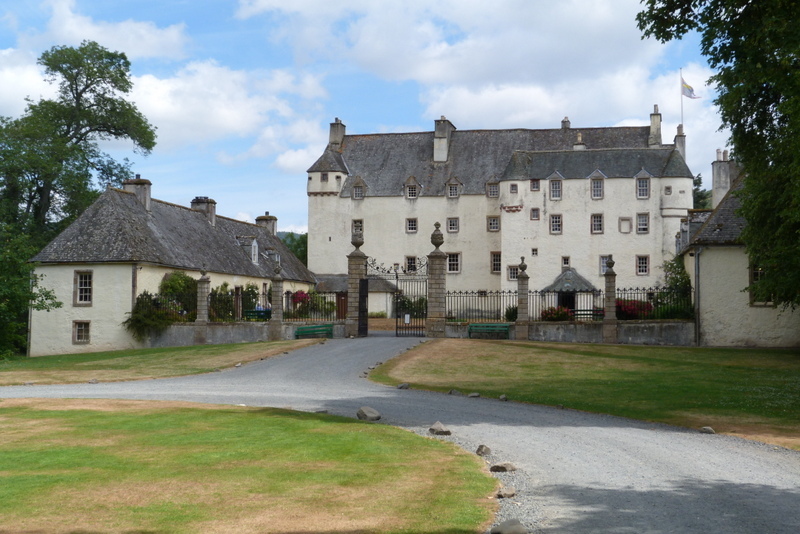 We continued past Galashiels and Melrose to Innerleithen, then through the little estate village of Traquair to Traquair House, which “The Buildings of Scotland” describes as “the eipitome of traditional Scottish domestic architecture.” From the outside, the main house is pretty much as it was in the 1500s, with a slightly projecting extension on the southern end, added in the 1590s. Two wings were made in the 1690s to form an attractive square space in front of the house. Perhaps fortunately for the picturesqueness of the house, two plans to “modernise” the front, in the 1690s and in 1744 were never carried out, and it has survived in the same outward form for the last 300 years. 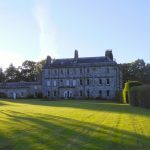 The house and its predecessors have been occupied by the Roman Catholic Stuart family, lately the Maxwell-Stuarts, since the 12th century, and much more than most stately homes it still has the feel of a family home. 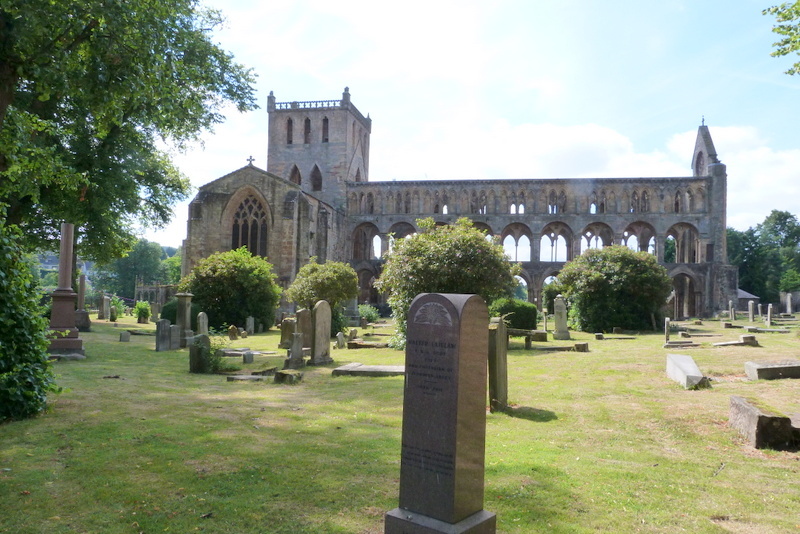 It was sufficiently secluded to avoid the predations of the English armies who knocked about Jedburgh Abbey on several occasions, but the family’s open adherence to Catholicism and the Jacobite cause ensured that they lived privately and relatively impoverished, which no doubt contributed to the survival of the house in the state we see today. Its interior must be an interpretative nightmare for architectural historians, with rooms and passageways of all periods inserted into the sixteenth century framework. On the second and third floors, reached up 16th century spiral staircases, were cosy early and late Georgian rooms, including a particularly attractive library and a muniments room. I was relieved to find that the latter no longer contained the open chests of irreplaceable family documents that I saw on my previous visit thirty years ago – they are being properly listed and archived at last. Notable amongst the household items on display were some 17th century “slips” – hand-embroidered panels of small pictures of birds, beasts and flowers intended to be cut out and applied to cushions and curtains. These are an extremely rare survival and retain their original rich colouring due to being stored, unused, in the dark for over 200 years, until rediscovered in the 20th century. 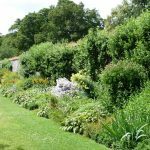 Features of the estate that I was unaware of from my last visit were the walled garden, with some gnarled old apple and pear trees swathed in the heaviest growth of lichens I have ever seen, and the woodlands containing some magnificent old fir trees. We finally identified them as Douglas Firs and Noble Firs. Also on the woodland walk is a circle of ancient yew trees which, it is said, was used as a shelter by the ladies of the house bathing in the Ladies’ Pool on the nearby Traquair Water. A pleasant café, and the house brewery’s excellent (and very potent) Traquair House Ale, provided opportunities for rest and relaxation. 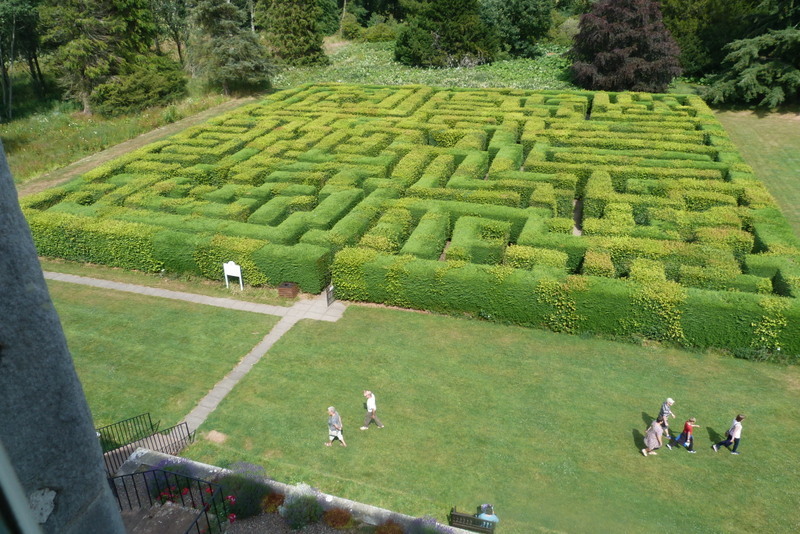 I didn’t attempt the fine modern maze behind the house, after viewing the layout from an upstairs window, but people were emerging from it alive and well, so that might be worth trying on another visit! The beautiful weather persisted all day, helping to make this a most enjoyable and worthwhile trip, for which our grateful thanks go to organiser Jennifer Britton and to our excellent Tynedale Coaches driver.